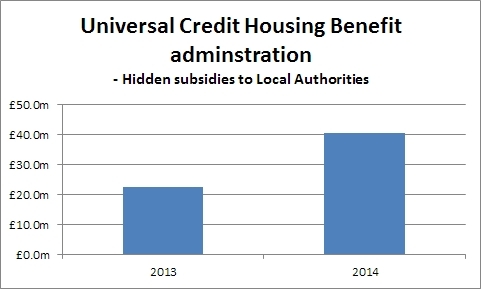 The Universal Credit project is over a year late in starting a significant geographical roll-out. Local Authorities had expected to be transferring their processing of Housing Benefit to the Department for Work and Pensions (DWP) by now. 1. Hidden in the DWP’s annual accounts is the line item “Other Programme Expenditure” which includes “subsidies paid by way of a grant to local authorities who administer and pay Housing Benefit”. This figure has grown to £40.6m to April 2014. 2. Dividing ‘Other Programme Expenditure’ into the 5,060 claimants actually receiving Universal Credit as at the April accounts year end = £7,198 per claimant. Of course we cannot be sure that all of the £40.6m relates to this subsidy, but DWP have not broken down this hidden figure.